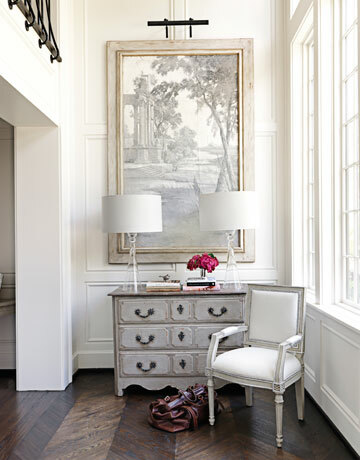 Mix and Chic: Home tour- A gorgeous and elegant Alabama home! 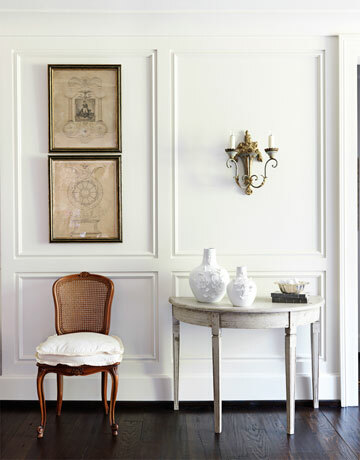 This traditional home is gorgeous and exudes a timeless, understated elegance. Everything is mostly neutral except for a few doses of pink accents sprinkled throughout the house. Although neutral, it is not dull because the house is filled with classic and beautiful details such as wood paneling, herringbone wood floors and wood moulding on the ceilings. Every room in this house is lovely but my absolute favorite room is the kitchen. What are yours? I agree. 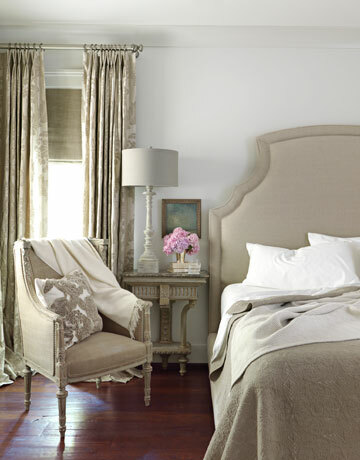 This understated and soft elegance is never dull. It stands the test of time and always feels so inviting. There is a quietness over the images you picked and I feel soothed just looking at them. I love these Jessie-especially the formal dining room, and the bedroom. So beautiful. Hope you've had a lovely week so far sweet friend! I love how spaceous these rooms feel, and the coloring for them! that kitchen!!! I love the seating!!! I feel like the kitchen is the heart of any home. lovely. hope your week is going well jessie! I'm a little in love with all of the terrific trimwork. So beautiful and elegant! Those double bar stools in the kitchen have me swooning! Gorgeous rooms, the fireplace is so cozy and charming! Beautiful. i love all the white with subtle pops of color. Love the stark white walls and clean look. Can I get my hands on those kitchen bar chairs? What do you even call that..a love barseat?? Fabulous! Just came upon your blog, and I'm definitely becoming your latest follower! I love this home tour. The injection of vibrant jewel tones in these classic, white-wrapped rooms is beyond brilliant - one of my favorite design styles. What a gorgeous home...I personally love the bathroom! Love that wood table with the fancy runner! And I totally need a chandelier over my dinner table. Beautiful pics! B-E-A-U-T-I-F-U-L! I love the refined eclecticism and elegance. I've never seen double bar stools before, how lovely and unique! Also love the use of the screen instead of curtains/blinds in the bathroom. Gorgeous find! P.S. Thank you for your words on my blog, I was touched that you shared your experiences too. I hope you are away from the negativity now and happy in your path, my lovely. You are amazing and fabulous! I love each and every one of these pictures, this house is absolutely stunning! Such a great inspiration!! !